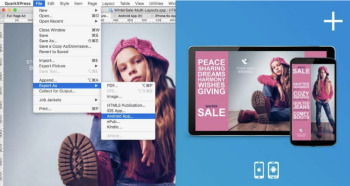 QuarkXPress is the leading graphic design and page layout software for creative professionals. It’s used by hundreds of thousands of users around the world who value quality and performance in their daily production of print and digital projects. QuarkXPress 2018 is the best desktop publishing software for print and digital projects, which makes it a real alternative and a viable replacement to InDesign and other design applications. For many years the changes in typography have been incremental rather than radical…that is until color fonts emerged. (Emoji icons on your phone are examples of color fonts.) While browsers have supported color fonts for years, print publications have ignored them until now: QuarkXPress 2018 is the first layout application that fully supports Color Fonts. QuarkXPress supports Color Fonts in SVG, SBIX and COLR formats. And you can use them in print, PDF and digital outputs. QuarkXPress 2018 now allows duplication of Digital layouts to Print layouts. This is powerful: Start with your digital design/publication first and then – in a second step – create a printable subset of it. – An update for Universal C Runtime is required on Windows 7 and 8.x.